Cala Liberotto is a paradisical bay not far from Orosei. The fine light grey sand unites with the turquoise water to create a fascinating interplay of colours. Stunning rocky reefs punctuate the beach and offer lots of underwater for snorkelling fans. Rich green Sardinian flora provides a beautiful background. With idyllic bays such as Cala Goloritzè, Cala Luna and Cala Mariolu, the Gulf of Orosei is a treasure trove for nature lovers: wild, romantic rocky beaches, some of which can only be accessed via idyllic footpaths - perfect for snorkelling, climbing, bathing and admiring. Hotel Bue Marino *** is located in a beautiful panoramic spot at a short distance from the main beach and the tourist marina of Cala Gonone. Constructed in 1959, the hotel takes its name from a cave inhabited by a Monk Seal, baptised "Bue marino" by the local fishermen. 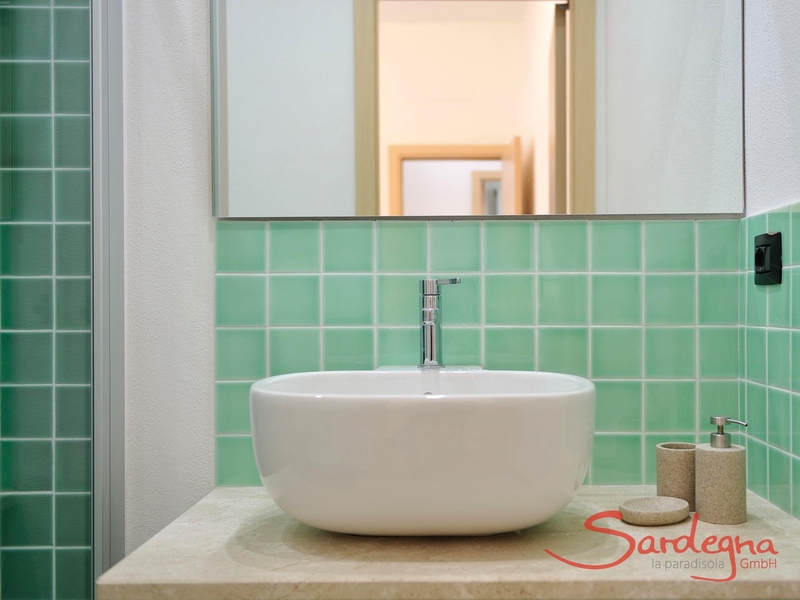 The Hotel Nuraghe Arvu hotel is a prestigious 4 star superior hotel which is positioned in one of Sardinia’s most suggestive corners. 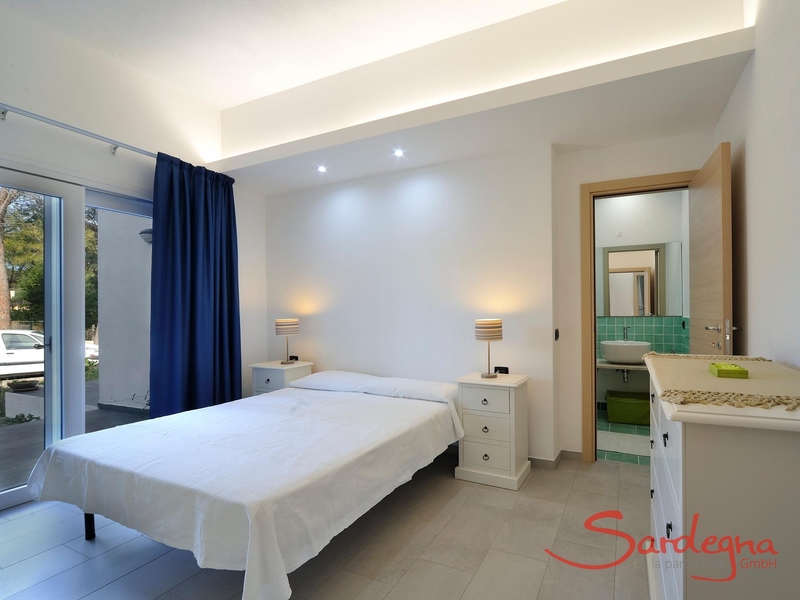 Its natural beauty, its elegant architectural style and furnishings, its functional services, its high quality cuisine and above all its Sardinian style and ancient cordial hospitality make this resort a true charmer. 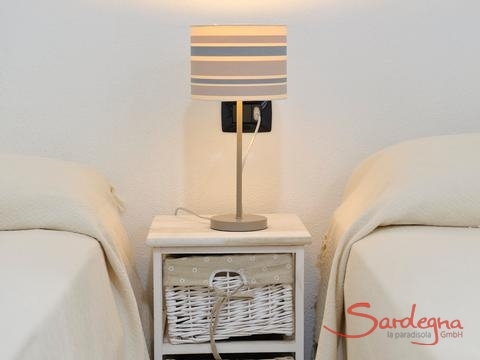 The farmhouse Tenuta Su Vrau extends under a dark forest of oaks and olive trees, in a happy position overview: 60 acres of green pastures and forest crops in a comfortable and serene place, immersed in the countryside overlooking the clear sea of Sardinia. Around the farmhouse, within a few kilometers, there are white beaches and a wild and fascinating hinterland, setting for those who love nature and hiking. 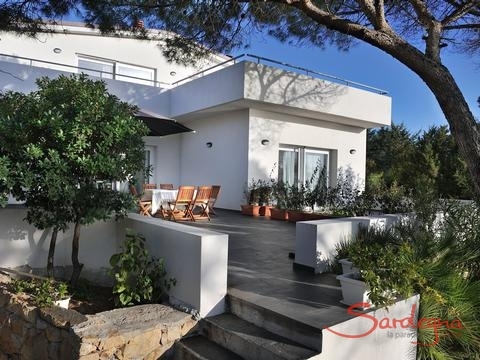 This work of modern architecture is nestled in an area with an enchanting landscape among olive trees and Mediterranean macchia. The aquarium was designed by the famous architect Peter Chermayeff. It consists of 24 different tanks adapted to the needs of Sardinia’s maritime ecosystems. In Orosei there is a children’s playground that is open until 20:00. In front of the hotel Tirreno is a small bar right on the beach, where you can sip a refreshing drink and enjoy a light meal. Sailing school open all year round with sailing lessons for all ages. 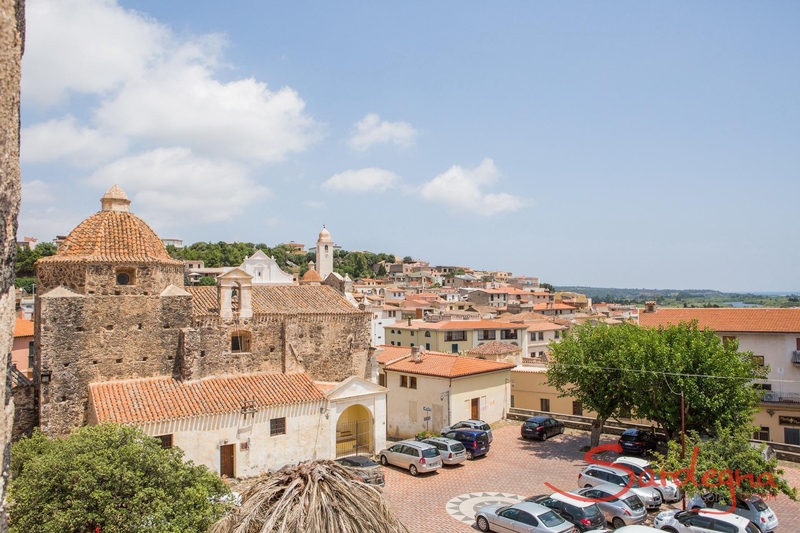 In these small towns, you can discover interesting churches, structures from the Nuragic culture and "Domus de Janas", which means "fairies' house" in Sardinian and refers to a type of rock-cut tombs. The town of Galtellì is only nine kilometres from Orosei, and it has received the “Bandiera arancione,” and Italian seal of quality in the field of environment and tourism awarded by the “Touring Club Italiano.” Galtellì earned its fame as the setting of the Nobel Prize winning novel “Reeds in the Wind” by Grazia Deledda. Well worth seeing are: the ruins of the Castello di Pontes; the Roman cathedral of San Pietro; the parish church Santissimo, which houses a wooden statue of Christ from the 14th century; the ethnographic museum Sa Domo'e sos Marras; the Castello Guzzetti palace; and the “Domus de janas di malìcas,” a Sardinian rock-cut tomb. Monte Tuttavista offers interesting hiking paths. This winery is located in the middle of the triangle that forms the sea, the mountains and the hills of Orosei. The vineyards cover an area of twelve hectares in an impassable area, which is best suited for wine production. Approximately 100,000 kilos of the highest quality grapes are harvested here. In the enoteca it is possible to taste the products directly on the spot. The cafeteria also houses a restaurant worth a visit (see Restaurants). A group of dorgalese wine farmers founded Cantina Dorgali in 1953. Due to constant growth and innovation, Cantina Dorgali has become one of the most famous brands in Sardinia today. On the SS125, about 12 kilometres to the north of Orosei, in the locality of Cala Liberotto, the beach of the same name is found. Here you will find white coarse-grained sand and spectacular cliffs that rise up out of the water. The beach dips gently into the sea, and hence it is ideally suited for children to play. The salt lake Sos Alinos is located in the background, with the typical vegetation of reeds and agaves. The sea as transparent as glass, and near the beach, dwarf fan palms and prickly pears predominate. Surfing and underwater fishing is also possible here – or you simply plunge in and refresh yourself in the magnificently clear water. If you follow SS 125 two more kilometres after the turn off to Cala Liberotto, then you turn off to the right and pass by the hotel Cala Moresca. 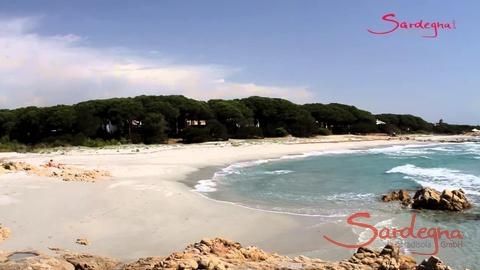 The beach belonging to the camp site Cala Ginepro is straight ahead, and to the left there is Spiaggia di Sa Curcurica with its fine white sand and azure water. In the background lies the salt lake Sa Curcurica. If you wade through the lake, you can reach the Bidderosa nature reserve. On the beach you can rent sun loungers and beach umbrellas, and there are bars and restaurants. 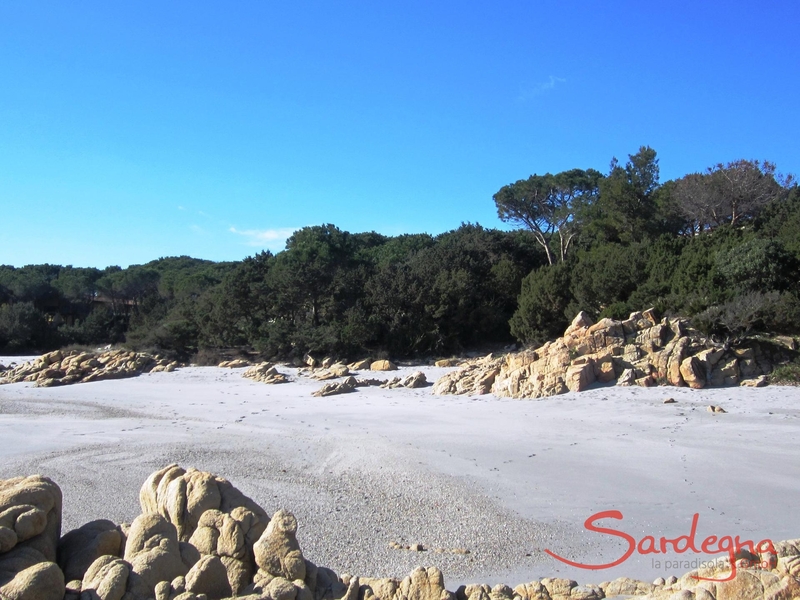 This is a nature reserve a few kilometres to the north of Cala Ginepro. The entrance is marked with a wooden sign, and the park is run by the forestry administration. Only a limited number of cars is permitted to enter the park each day. The entry fee is about 10 Euro per vehicle. However, you can also reach the park by a foot path or wade through the salt lake Spiaggia di Sa Curcurica. The park measures roughly 530 hectares, and it was reforested with great effort over the course of many years by the Sardinian forestry authority. It features typical Mediterranean vegetation such as junipers, wild pistachios, myrtles and pines. Within the park there are five gorgeous bays that can be reached by car (4 to 7 km). Follow SS125 farther north, and then turn right roughly 6.5 km after the signs for Cala Ginepro onto a gravel road (in poor condition!! ), after roughly 2.5 km, you will reach the parking place for Spiaggia Berchida, one of the most beautiful beaches on the island. The dazzling white sandy beach and the crystal-clear sea, shimmering in all shades of blue, are nestled beautifully in the landscape. In peak season, a few bars and restaurants are available. Wild and solitary nature, an amazingly long, fine sandy beach and azure, gently sloping water make Spiaggia Berchida a dream beach. Except for the area around the car park, the beach is not crowed even in peak season and is very clean with small patches of seaweed. You absolutely must see Spiaggia Berchida! The Via Mare leads from the centre of Orosei to a car park. The approximately 5 km long coastal section is divided into the beaches Su Barone, Isporoddai and Osalla. On the Marina di Orosei beach there is a small tourist port. From here boats start to the different bays of the Gulf of Orosei, and rubber dinghies can be hired. Visitors delight in the nature scenery and spectacular panorama: golden, partly fine, partly coarse sand and deep blue water. Even in the high season, the beach is only crowded near the car park; the remaining sections are nearly devoid of beachgoers. The beach is very clean and there is hardly any sea grass. 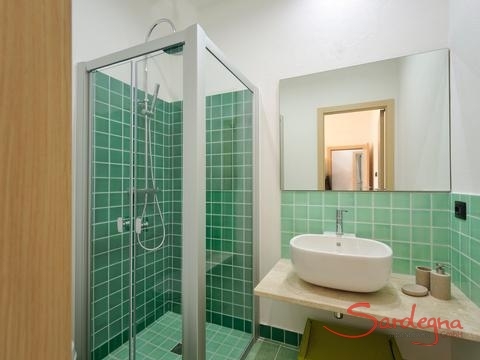 There are bars, restaurants, shops and toilet facilities. If you drive from Orosei about 22 kilometres northwards on the SS125, you arrive at the sign for Capo Comino. Turn right here, follow the road about 700 meters and then turn left. After about 600 meters you reach the car park. 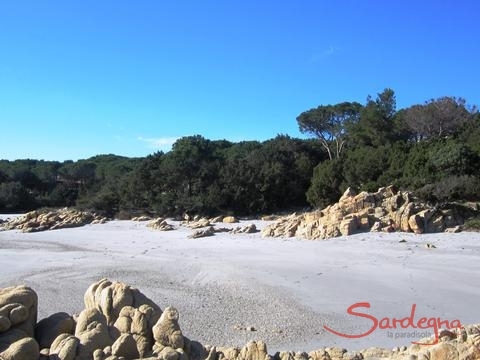 The fine, white sandy beach is bordered by the largest dunes of the province of Nuoro, where you will find untouched and wild nature and a deep blue, flat sloping sea. Even in the high season, the beach is not particularly overcrowded and quite clean. In several places, however, the beach has sea grass on it. 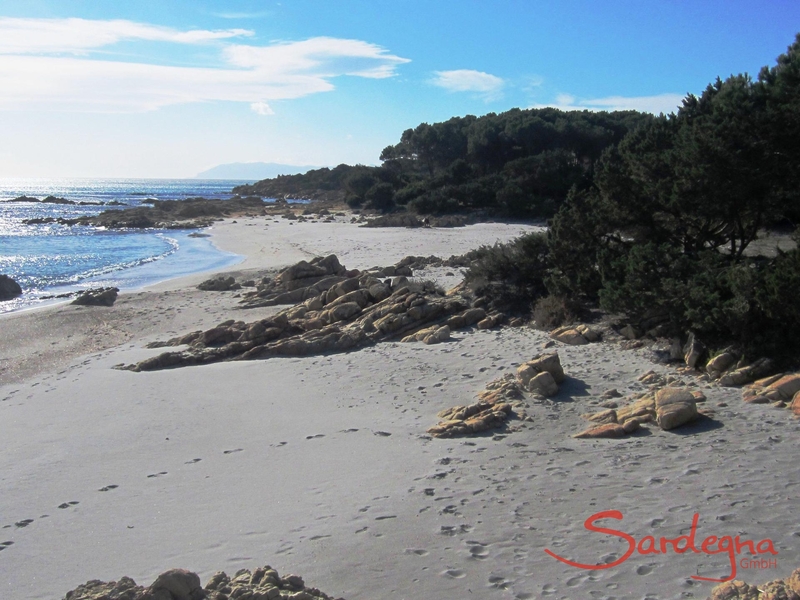 Going north, you can find other beautiful beaches, such as Santa Lucia and La Caletta. The beaches south of Orosei South of Orosei are the famous bays of the Gulf of Orosei. Most can be reached by boat or by footpaths, some of them also by car. On SS 125 follow the signs for Dorgali. Roughly 15 kilometres behind Orosei follow the street signs for the Grotta di Ispinigoli, pass the associated hotel and the entrance of the cave. After 4 kilometres you take a right and follow the road roughly 2.7 kilometres, and then take a gentle right. After 400 metres take another right, and after 150 metres you reach your destination. The road is very narrow at times and not in very good condition. At this beautiful location, the limestone coast of the Golf of Orosei begins to the south. The small bay Cala di Cartoe is surrounded by unspoiled nature. The beach is covered with fine, golden sand interspersed with pebbles, the water is azure and slopes gently. During peak season the beach has some visitors; however, it is not overcrowded. It is clean and there are only occasional seaweed patches. 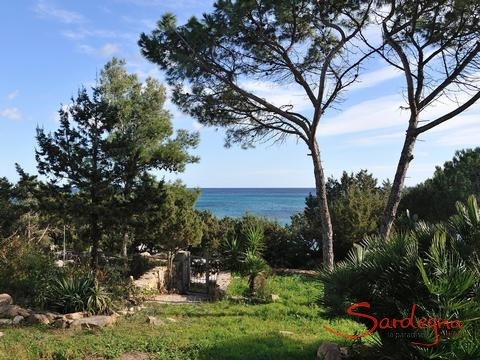 In the Cala Gonone holiday resort, you cross the Viale Bue Marino (the signposting is not very good; however, the location is easy to find in the pine forest) and follows the panoramic road. Leave the Cala Ziu Martine behind you and go up to the end of the road. You reach the beach by steps that lead along an old path that the coal miners and shepherds used to use (if you wish, you can follow this path further to the south to reach the famous beach of Cala Luna, although the path here becomes significantly more strenuous). The small bay is located in the middle of unspoilt, wild nature; its beach consists of white, medium-sized pebbles; the sea is turquoise and flat. Since many people prefer sandy beaches, Cala Fuili is scarcely crowded even in peak season. The beach is clean, and there are very few patches of seaweed. The Nuragic tower Mannu is located nearby, and guided tours are available. The Orosei Gulf is one of the most beautiful coastlines in the Mediterranean. Between the cliffs are enchanting caves (Grotta del Bue Marino, Grotta del Fico) and fabulous beaches (Cala Luna, Cala Sisine, Biriola Cala, Cala Mariolu, Cala Goloritzè). From June to September you can reach the Orosei Gulf by boat from the harbour of La Caletta-Siniscola drive (25 km south of San Teodoro). For the rest of the year boats depart from the harbour of Orosei or Cala Gonone (about 70 km south of San Teodoro). On Road 125 direction Dorgali, roughly 15 kilometres from Orosei, you will see the road signs for the stalactite cave Ispinigoli. Inside the cave there is a roughly 38 metre tall stalactite stretching from the cave's floor to its ceiling. The cave arch is only partly accessible: in many places the path is blocked by rocks. Another special feature of this cave is the so-called “Abisso delle Vergini” (Abyss of the Virgins), a roughly 60 metre deep, thin shaft that connects the Grotta di Ispinigoli with the Grotta di San Giovanni Su Anzu. The name “Abyss of the Virgins” is based on a legend that the cave was a place where virgins were sacrificed in a Phoenician sacrificial fountain. In fact, however, the pieces of jewellery and human remains that have been found in the crevice point to typical burials of Nuragic populations. The Nuragic settlement of Serra Orrios is on road 129 direction Dorgali, roughly 18 kilometres from Orosei. If you are interested in archaeology, you will find one of the largest and best preserved sites consisting of roughly one hundred cabins: in partially very simple, partially very elaborately built. The village also features two religious sites. The numerous artefacts found during different excavations span from the mid- to the late Bronze Age, and are found today in the archaeological Museum of Dorgali. The large caves of the Dorgali coast owe their names to the Sardinian name for the monk seal, a magnificent specimen of mammal that has nearly vanished. The splendid caves of Bue Marino can be reached from Cala Gonone, Orosei, Santa Maria Navarrese, Arbatax, La Caletta or Siniscola. The 5 km long cave, divided into two branches, is visitable for around 900m along built up and illuminated passageways. The visit only follows the southern branch along a route rich in stalactites and stalagmites that offer a chromatic show of extraordinary beauty thanks to the pools of light that penetrate to the inside, enhanced by the clear waters of the large saltwater lake. This lake is among the largest in the world, at over a kilometre in surface. The walk of about 30 minutes ends on the beach known as "'seal beach"", where the monk seal gave birth to her young. The Grotte del Bue Marino can be reached by boat from different places in the Golfo di Orosei: Cala Gonone, Orosei, Santa Maria Navarrese, Arbatax, La Caletta near Siniscola. The experienced trekking and hiking guides are able to guide clients on very interesting excursions for every level in the territory of the Supramonte as well as along the coast of the Gulf of Orosei. The objective is to get to know the historical and environmental aspects of the territory. 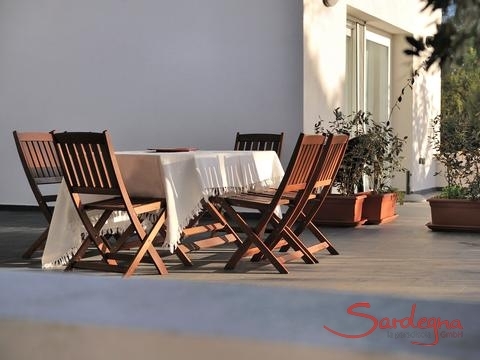 Here you can enjoy typical Sardinian cuisine. Enchanting and very typical little square half way to the breath-taking Spiaggia Berchidda. It is true that the road is in a bad condition, but the courtyard is wonderful and the food is very good. In this quaint agriturismo, the Italian "mamma" cooks herself, and all the ingredients are from their own production - from creamy ricotta over the spicy zucchini tart to the fruity Mirto. Weather permitting, meals take place under the open sky, and the view over the vineyards highlights the pleasant atmosphere. Follow the SS 125 toward Siniscola. Shortly after the turn-off towards Santa Lucia, there's a dirt road on the left to the agriturismo. The route is signposted. Various bike routes on the Gulf of Orosei and an obstacle course for mountain bikes. For boat trips to the most beautiful beaches, you can contact Tonino or Valentina. If you mention that you are a guest at Hr. Poggiu's house, you will surely be treated well. The boats approach several beaches of the Gulf of Orosei, among them some of the Mediterranean's most beautiful: Cala Luna, Cala Mariolu, Cala Sisine and Cala Mariolu. It is possible to participate in a guided tour of the Grotta del Fico. Return to the port of Orosei is at 18:00, to La Caletta at 19:00. From the port of Cala Gonone there's a taxi service that leaves at different times to Cala Luna with a visit to the caves of Blue Marino. A small cruise ship runs along the bays of the Gulf of Orosei. The ship, called Motonave Imperatrice, departures between 08.30 and 09.00 from "La Caletta" or from Orosei at 10.00. It is stops in the three most beautiful bays (Cala Luna, Cala Sisine and Cala Mariolu) and it is possible to take a guided tour of the Grotta del Fico cave. The ship return to Orosei at around 18:15, or to La Caletta at around 19:00. Those wishing to explore the Gulf of Orosei on their own can rent a boat in Cala Gonone. Just a few steps from the house, you will find a campground with a good restaurant. A real secret tip is the restaurant belonging to the same name: generous rooms and wooden tables like a wine cellar from the past. Fitting to the wines of the estate, set menus can be ordered here, either with meat or with fish. Since it is an enoteca, you have, of course, the opportunity to taste the products directly on the spot. Local cuisine in a refined atmosphere, also pizza. Supermarket in the hotel "Degli Svizzeri"
This supermarket is located within the hotel, right at the beginning of the beach promenade. The supermarket is located on the SS 125 near the car park for the Cala Liberotto. In Orosei you will find various supermarkets, some of them also in Via del Mare, which leads to the Marina di Orosei beach. From Cala Liberotto, at the entrance of Orosei, shortly after the bridge. In Orosei you will find various supermarkets, some of them also in Via del Mare, which leads to the Marina di Orosei beach. From Nuoro, at the entrance of Orosei, very close to the church of Chiesa del Rimedio. Water sports centre in Santa Lucia (on the road to La Caletta): sailing school, windsurfing, catamarans. Here you can rent sailboats, catamarans, surfboards and canoes. 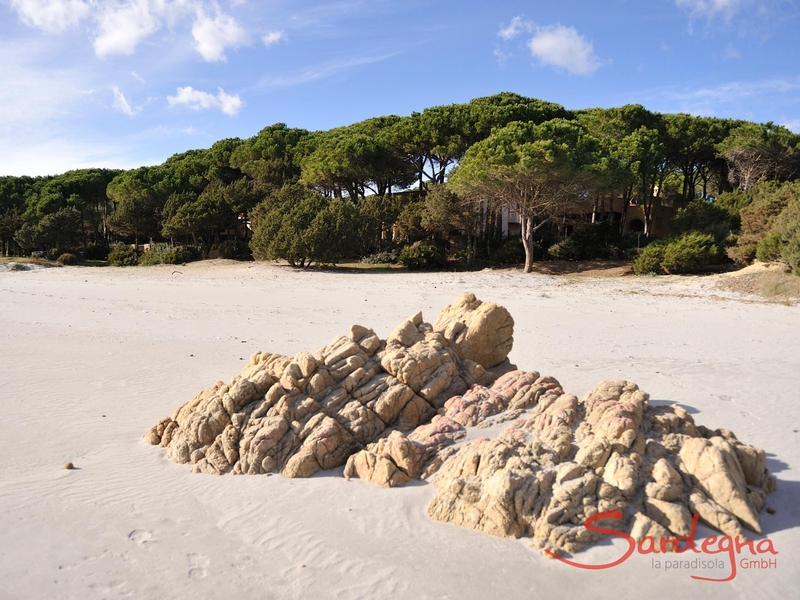 Spiaggia di Santa Lucia, only with advance booking. The Orosei Diving centre offers the opportunity to dive into the depths of the sea to explore its rich fauna and flora. 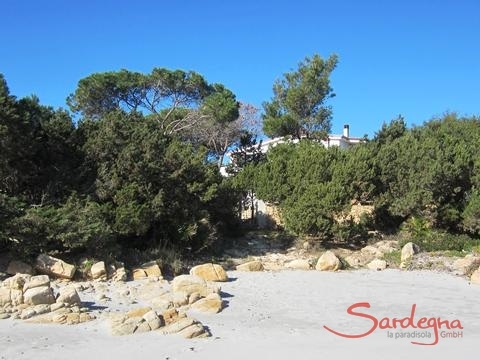 In the Gulf of Orosei, one of the most beautiful coasts in Sardinia, far from mass tourism is the wonderful sandy bay of Calaliberotto, where this property Calaliberotto lays under shady pines, divided into four newly renovated apartments. 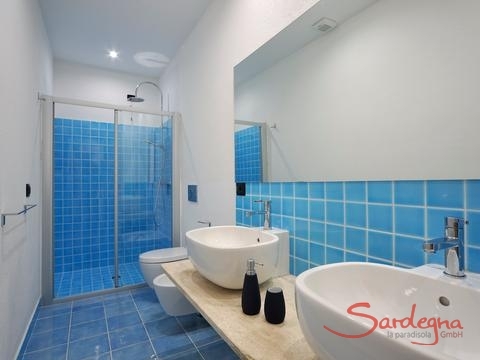 Each unit has a terrace facing the turquoise sea, whose blue shades are made even more intense by the mistral winds. Only a gate separates the house from the beautiful sandy beach. 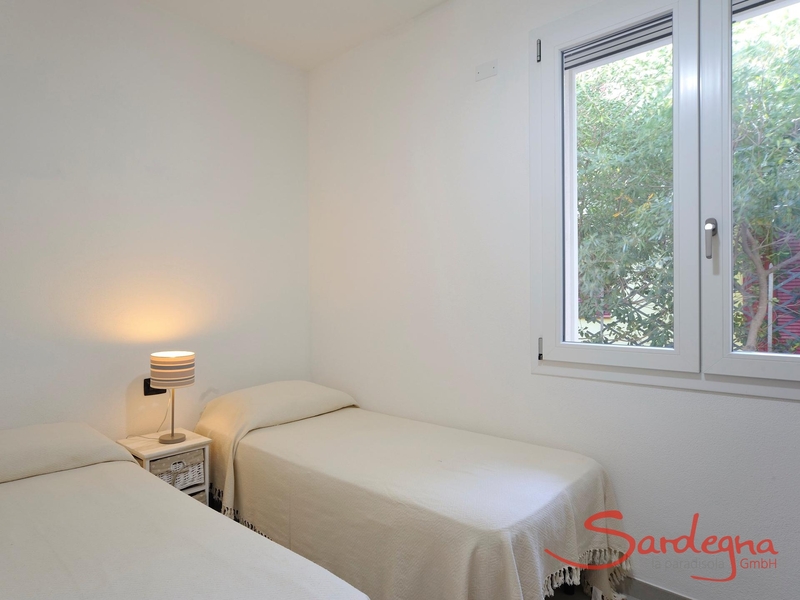 It is the ideal place for a relaxing holiday by the sea, but also for discovering the real culture and nature of Sardinia. Some interesting trekking routes begin only a few kilometres away and the nearby beaches, including the natural oasis of Biddaerosa are worthwhile a visit! 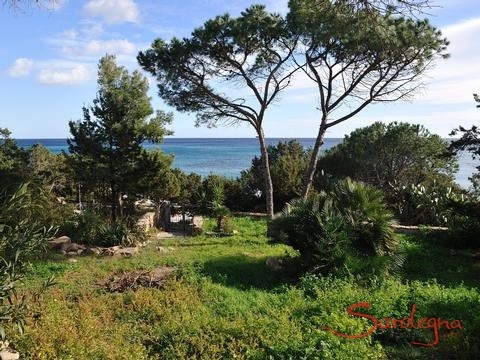 From the beautiful apartment with an outdoor terrace, you can enjoy the star sprinkled nights and the sea view through pine trees. The house, owned by two brothers, was completely renovated in 2011 and divided into 4 apartments, 2 on the ground floor and 2 on the first floor, all tastefully furnished and all with a beautiful terrace overlooking the sea. 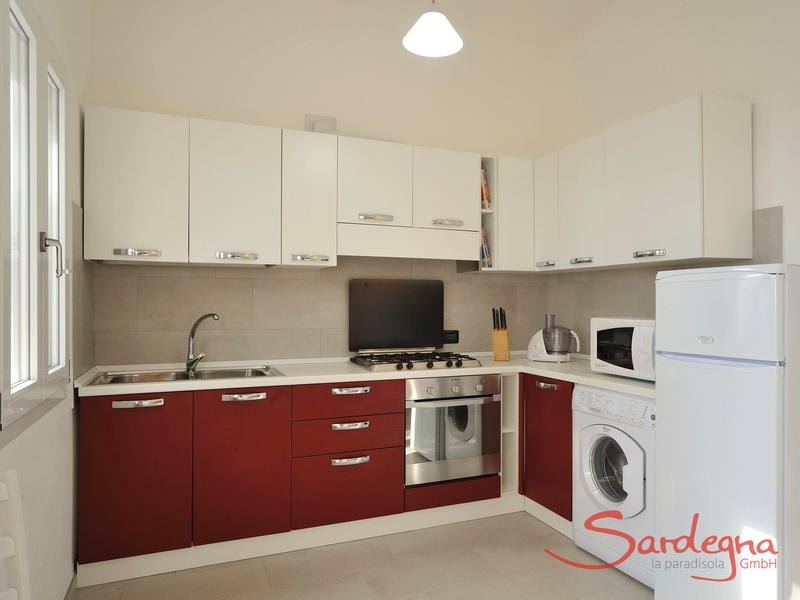 The apartment Cala Liberotto I, furnished in a modern style, is located on the ground floor and has a living room with sofa, dining table and kitchenette with an oven and a washing machine but no dishwasher. There is one double bedroom and two bedrooms with two twin beds that can be joined, two bathrooms with shower. The living-room leads out to the large terrace, which offers a beautiful view of the sea and on which you can enjoy the warm summer nights under the stars. The terrace is furnished with wooden furniture and a large umbrella which provides shade. 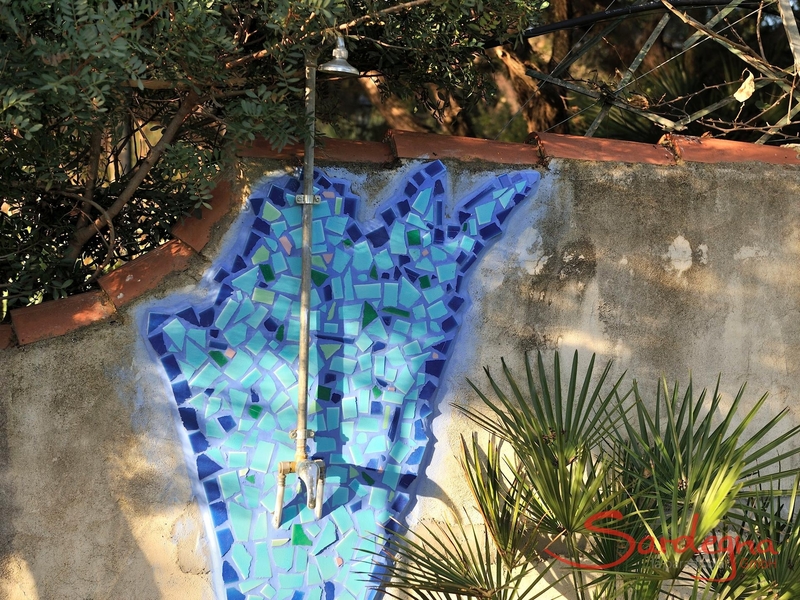 In the garden, near the gate that leads to the beach, there are two outdoor showers which are shared with the other apartments. Also in common use with the other apartments is the stone barbecue in the back garden. 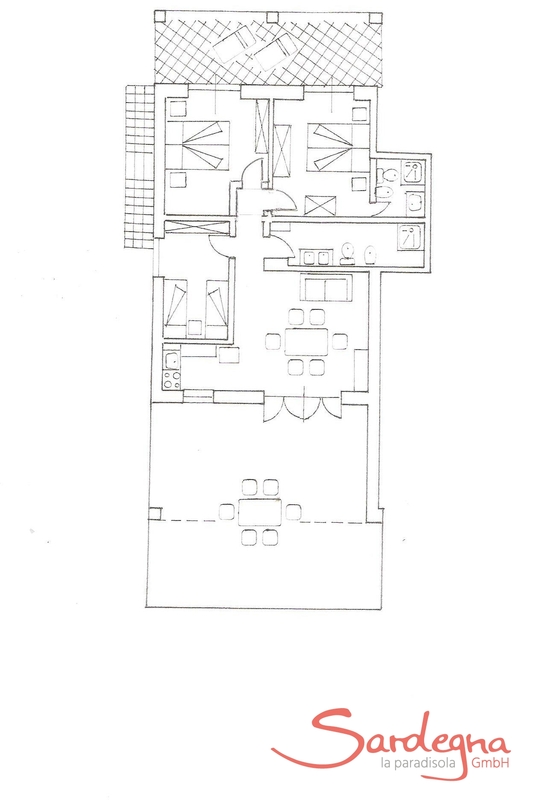 Each apartment is assigned one parking space inside the property. 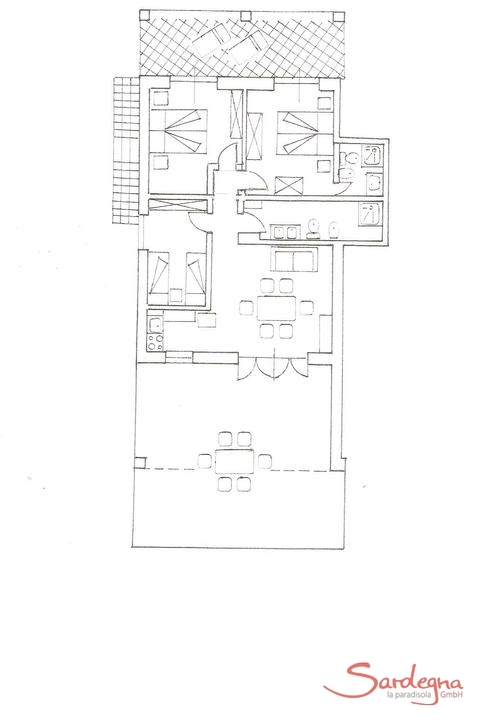 Enjoy the video of the apartment Cala Liberotto I! Cala Liberotto is one of the most beautiful areas on the east coast of Sardinia. Only a stroll from the house you will find supermarkets, bars and restaurants. The village is surrounded by pine trees overlooking numerous small fine sandy coves. In addition to the beach Calaliberotto, you should visit the beautiful nearby beaches: Su Barone, Osala, Cala Ginepro, or the natural oasis of Biddaerosa which is characterized by fine silver sand and surrounded by rocks, juniper, pine trees and wild lilies, furthermore the beaches Berchida and Capo Comino with their beautiful white sand dunes. Calaliberotto is only a few kilometres from Orosei with its beautiful old town that still preserves many buildings from the Middle Ages. Craft shops and small boutiques selling local products will draw your curiosity and the scent of traditional freshly baked bread will capture your senses. Calaliberotto is also an excellent starting point for excursions and trekking to visit the area of Dorgali and Cala Gonone. In this vast area nature has created extraordinary natural monuments such as the caves of Ispinigoli and Bue Marino and some beautiful bays, among them being the famous Cala Luna. Mini-cruises to visit the caves Grotte del Bue Marino and the bay of Cala Luna via Sea start from nearby Orosei. Alternatively you can reach the village of Cala Gonone in only 40 minutes by car and here you can rent a boat or -why not?- a kayak! Deep shades of blue, the sea in front of your houseIn the Gulf of Orosei, one of the most beautiful coasts in Sardinia, far from mass tourism is the wonderful sandy bay of Calaliberotto, where this property Calaliberotto lays under shady pines, divided into four newly renovated apartments. Each unit has a terrace facing the turquoise sea, whose blue shades are made even more intense by the mistral winds. Only a gate separates the house from the beautiful sandy beach. It is the ideal place for a relaxing holiday by the sea, but also for discovering the real culture and nature of Sardinia. Some interesting trekking routes begin only a few kilometres away and the nearby beaches, including the natural oasis of Biddaerosa are worthwhile a visit!A large terrace and a gate to the seaFrom the beautiful apartment with an outdoor terrace, you can enjoy the star sprinkled nights and the sea view through pine trees. The house, owned by two brothers, was completely renovated in 2011 and divided into 4 apartments, 2 on the ground floor and 2 on the first floor, all tastefully furnished and all with a beautiful terrace overlooking the sea. The apartment Cala Liberotto I, furnished in a modern style, is located on the ground floor and has a living room with sofa, dining table and kitchenette with an oven and a washing machine but no dishwasher. There is one double bedroom and two bedrooms with two twin beds that can be joined, two bathrooms with shower. The living-room leads out to the large terrace, which offers a beautiful view of the sea and on which you can enjoy the warm summer nights under the stars. 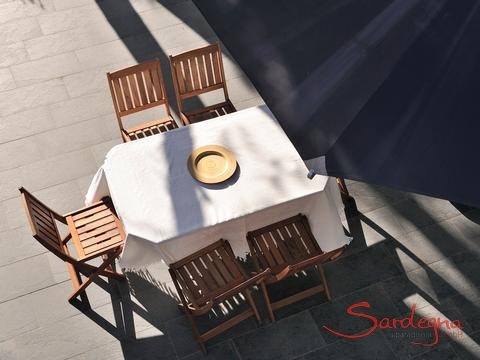 The terrace is furnished with wooden furniture and a large umbrella which provides shade. 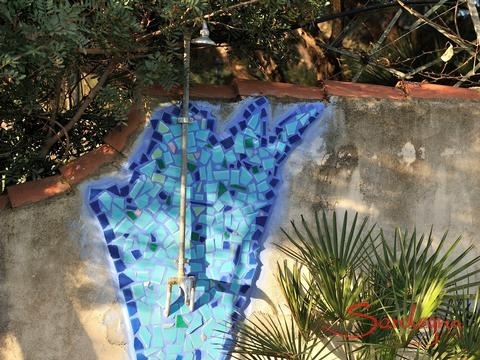 In the garden, near the gate that leads to the beach, there are two outdoor showers which are shared with the other apartments. Also in common use with the other apartments is the stone barbecue in the back garden. 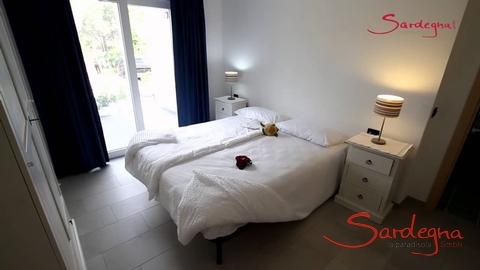 Each apartment is assigned one parking space inside the property.Enjoy the video of the apartment Cala Liberotto I!The AreaCala Liberotto is one of the most beautiful areas on the east coast of Sardinia. Only a stroll from the house you will find supermarkets, bars and restaurants. 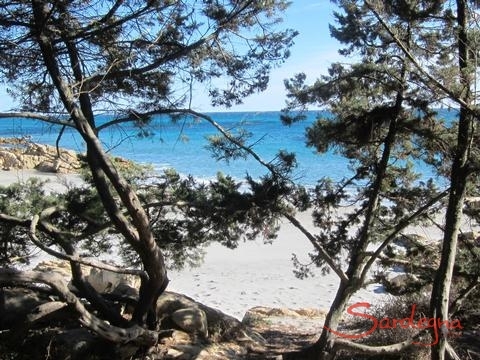 The village is surrounded by pine trees overlooking numerous small fine sandy coves. 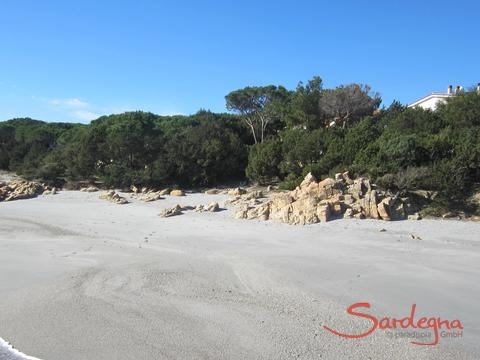 In addition to the beach Calaliberotto, you should visit the beautiful nearby beaches: Su Barone, Osala, Cala Ginepro, or the natural oasis of Biddaerosa which is characterized by fine silver sand and surrounded by rocks, juniper, pine trees and wild lilies, furthermore the beaches Berchida and Capo Comino with their beautiful white sand dunes. Calaliberotto is only a few kilometres from Orosei with its beautiful old town that still preserves many buildings from the Middle Ages. 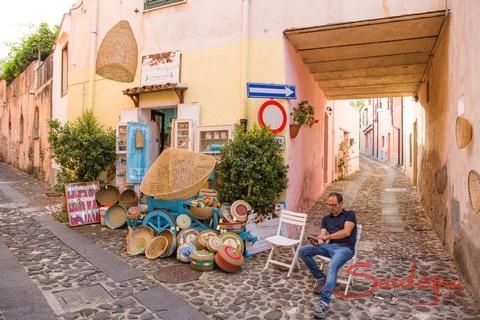 Craft shops and small boutiques selling local products will draw your curiosity and the scent of traditional freshly baked bread will capture your senses. Calaliberotto is also an excellent starting point for excursions and trekking to visit the area of Dorgali and Cala Gonone. In this vast area nature has created extraordinary natural monuments such as the caves of Ispinigoli and Bue Marino and some beautiful bays, among them being the famous Cala Luna. Mini-cruises to visit the caves Grotte del Bue Marino and the bay of Cala Luna via Sea start from nearby Orosei. Alternatively you can reach the village of Cala Gonone in only 40 minutes by car and here you can rent a boat or -why not?- a kayak! Cala Liberotto II is a charming apartment with a rooftop terrace on Sardinia's east coast. 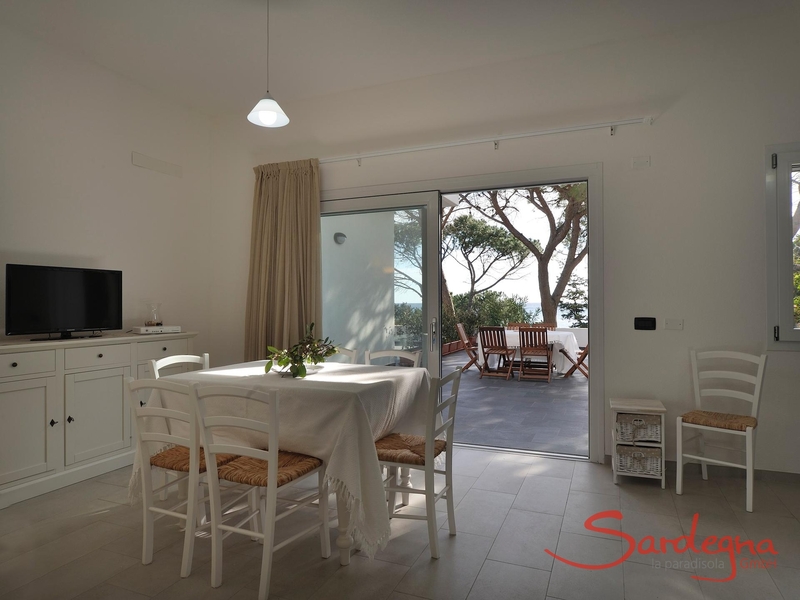 From here you have an overwhelming view of the sparkling sea and the spectacular Cala Liberotto beach, which is just a few steps from the house. Book now and have something to look forward to!